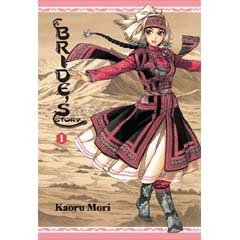 A Bride’s Story tells the tale of a beautiful young bride in nineteenth-century Asia. At the age of twenty, Amir is sent to a neighboring town to be wed. But her surprise at learning her new husband, Karluk, is eight years younger than her is quickly replaced by a deep affection for the boy and his family. Though she hails from just beyond the mountains, Amir’s clan had very different customs, foods, and clothes from what Karluk is used to. As the two of them learn more about each other through their day-to-day lives, the bond of respect and love grows stronger.